Background/Aim: Helicobacter pylori (H. pylori) infection is one of the most common chronic infections in the world. The prevalence of H. pylori is high in Saudi Arabia, but there are no studies in children on the accuracy of invasive and noninvasive methods to diagnose H. pylori infection. The aim of this study was to evaluate the accuracy of six methods for diagnosis of H. pylori infection; four invasive [rapid urease test (RUT), histology, antral nodularity (AD), and biopsy culture (BC)] and two noninvasive methods [serologic test and stool antigen test (SAT)]. Patients and Methods: A prospective cross-sectional study was performed among symptomatic children in National Guard hospitals who underwent esophagogastroduodenoscopy from 2010 to 2013. The gold standard diagnosis of H. pylori was positive tissue culture. If the culture was unsuccessful or not done, concordant-positive results for histology and RUT were considered to indicate a positive H. pylori. The variables analyzed as diagnostic methods included RUT, BC, histology, AD, serologic test, and SAT. Results: A total of 303 children were included in the study. The overall prevalence of H. pylori infection was 49.8%. Most diagnostic tests showed high specificity and moderate-to-low sensitivity when compared to the gold standard test. Sensitivity of AD, SAT, and RUT to detect H. pylori were 62% (95% CI: 0.51–0.74), 69% (95% CI: 0.58–0.79), and 87% (95% CI: 0.79–0.95), respectively (P value 0.040, 0.0023, and <0.0001, respectively). RUT showed the lowest specificity, 65% (95% CI: 0.58–0.71) in contrast to BC and histology which showed moderate-to-high specificities of 88% (95% CI: 0.82–0.95) and 89% (95% CI: 0.82–0.95), respectively (P <0.0001). 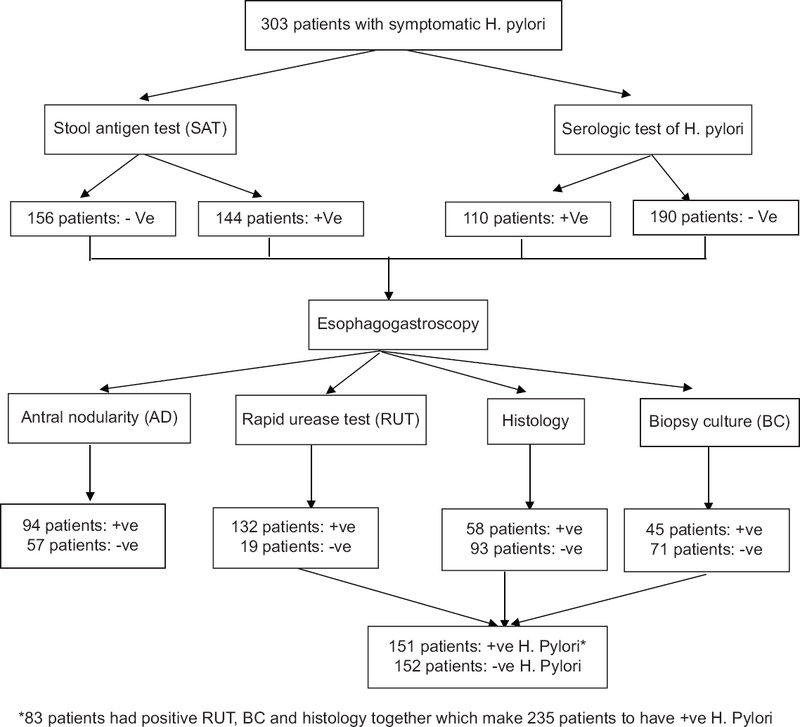 Conclusion: RUT is a valuable diagnostic method for identifying H. pylori with the highest sensitivity compared to AD and SAT. All diagnostic tests showed moderate-to-high specificities but BC and histology showed the highest specificity. Helicobacter pylori (H. pylori) infection is one of the most common chronic infections in the world. H. pylori is usually acquired in early childhood and probably persists throughout life. The diagnostic techniques for detection of H. pylori infection are classified as invasive and noninvasive methods. H. pylori infection can be detected by invasive (rapid urease test [RUT], histology, and bacterial culture [BC] from biopsy specimen) and noninvasive (stool antigen test [SAT], urea breath test [UBT], and serology) methods. Noninvasive tests are easier to accomplish but need appropriate validation of methods for each population and age. Serological testing is less accurate than UBT and SAT, particularly in areas of low H. pylori prevalence in developed countries, and cannot differentiate past from present infection. SAT and UBT have the advantage of indicating current, ongoing infection, but both tests are affected by several parameters, such as colonization density, nutrition, and comedication. Invasive tests have been considerate the gold standard, but biopsy-based methods may suffer from sampling error because of the patchy nature of the infection, low concentration of bacteria in fragments and low sensitivity culture. We have previously reported that H. pylori infection has a high prevalence among Saudi children. However, there are no studies evaluating the accuracy of invasive and noninvasive methods to diagnose H. pylori infection in Saudi children. The aim of this study was to evaluate the accuracy of six methods for diagnosis of H. pylori infection; four invasive (RUT, antral nodularity [AD], histology, and BC) and two noninvasive methods (serologic test and SAT). The study was performed prospectively in two aligned tertiary care hospitals: King Abdulaziz Medical City (Western region, Jeddah) and King Abdulaziz Medical City (central region, Riyadh), from January 2010 to January 2013. In this prospective 3-year study, all children who required esophagogastroduodenoscopy (EGD) for symptoms suspicious for H. pylori infection (abdominal pain, unexplained anemia, upper gastrointestinal bleeding, recurrent vomiting, or poor growth) or who tested positive for H. pylori by serology or SAT were recruited. The inclusion criteria were any one of the following: (1) symptomatic patient age less than 14 years, and (2) positive screening for stool H. pylori antigen or serum H. pylori antibodies in a pediatric patient with gastrointestinal symptoms. The exclusion criteria were as follows: (1) history of previous H. pylori infection, (2) history of previous use of antibiotics or proton-pump inhibitors at least 2 weeks before endoscopy, and (3) history of concomitant illness (e.g., inflammatory bowel disease, eosinophilic gastritis/enteropathy, or coagulopathy). Stool samples were collected on the same day of patient recruitment and tested in a laboratory for H. pylori antigen (ImmuneSTAT HpSA; Meridian Diagnostics, Cincinnati, OH, USA). The samples were analyzed using a monoclonal enzyme immunoassay SAT. After 1 h of incubation at room temperature, the sample well was washed to remove unbound samples and enzyme-labeled antibodies. The presence of bound H. pylori antigens was determined by the development of a yellow color, which was considered positive. Serum anti-H. pylori IgG antibody detection was performed using antibody titer (NOVA Lisa kit; Novatech Immunodiagnostica, Germany). The antibody titer was automatically measured using a chemiluminescent enzyme immunoassay method. An antibody titer ≥4.0 U/ml was defined as positive, according to the manufacturer's instruction sheet. EGD was performed under conscious or deep sedation, and biopsies were taken with FB-21K forceps (Olympus, Lake Success, NY, USA). During the procedure, endoscopic findings (esophagitis, gastric erythema, gastric ulcer, AD, duodenal ulcer, pigmentation, mucosal friability, polyps, and active bleeding) were recorded. Two antral biopsy specimens were taken for histologic examination. The biopsy specimens were fixed in 10% formalin and stained with hematoxylin and eosin (H and E). Silver or Giemsa staining was used to confirm the presence or absence of H. pylori only if the results of H and E staining were equivocal. Each set of specimens was reviewed by an experienced pathologist who was blinded to the history and results of the endoscopy, RUT, H. pylori serology and SAT. Histologic evaluation of the specimens was performed to grade the severity of both active and chronic inflammation and the density of H. pylori organisms. A single biopsy specimen from the antrum was obtained for the RUT (campylobacter-like organism (CLO); Tri-Med Specialties Inc., Osborne Park, WA, Australia). Typical orange color change within 24 h was regarded as positive. Biopsy specimens taken from the antrum for H. pylori culture were immediately placed in a transport medium (normal saline) at 4°C and transported within 2 h to the laboratory. The biopsies were quantitatively plated onto H. pylori-specific medium: Colombia agar (Pasteur Institut Production, Marnes la Coquette, France) supplemented with 10% horse blood (Eurobio, Paris, France). The plates were incubated at 37°C for 4–7 days under microaerobic conditions (10% CO2, 5% O2) in a gas-regulated incubator (Forma Scientific, Marietta, OH, USA). An antimicrobial susceptibility test was performed when a biopsy culture (BC) was positive. To confirm H. pylori infection in a study subject, three diagnostic tests were used: histologic presence of the bacteria in the gastric biopsy, a RUT (CLO test) performed on a biopsy sample, and gastric tissue culture. Positive BC was accepted as the gold standard for diagnosis of H. pylori infection. However, if the culture was negative or not done, concordant-positive results for histology and RUT were considered to indicate a positive H. pylori status. Patients who did not fit these diagnostic criteria were considered as H. pylori negative and included in the comparison control group. The associations of sociodemographic characteristics with H. pylori-positive results of children were examined through univariate analysis. Backward-stepwise procedures were used to build the multivariate analysis; the final model included only those variables that were found to be statistically significant in the univariate analysis. The associations were expressed as odds ratios (OR) with their confidence intervals (95% CI). The data were analyzed with SPSS software (SPSS for Windows, version 13). Demographic data were compared by using Fisher's exact test or the Wilcoxon rank-sum test when appropriate. A two-tailed test indicated statistical significance at P < 0.05. This study was approved by the Ethics and Research Committee of the National Guard Health Affairs, King Abdullah International Medical Research Center. The parents or legal guardians gave their written informed consent for their children to participate in the study. All information collected was kept strictly confidential. A total of 303 children, 149 males (49.2%) and 154 females (50.8%), were enrolled in the study with a mean age of 7.5 years (range 6 months–14 years). The total number of H. pylori-positive individuals was 151, for an overall prevalence of 49.83%. Our data showed predictive demographic characteristics by a binary logistic regression model with a weak predictive power, with a c-statistic of 66%. The age group 3–6 years had a 7.9-fold higher likelihood of H. pylori infection compared to the age group <3 years [Table 1]. Similarly, the age groups 6–10 years and over 10 years had OR of 10.47 and 11.84, respectively, compared to subjects <3 years old. Gender was identified as an irrelevant characteristic for H. pylori acquisition [Table 1]. The number of positive bacterial cultures, RUT, and histology was 45 (14.9%), 132 (43.6%), and 58 (19.1%), respectively, and the number of positive serology and SAT was 77 (25.4%) and 104 (34.3%), respectively. Only 83 (27.4%) patients had positive cultures, RUT, and histology. Flowchart of the outcome of six methods for screening and diagnosis of H. pylori infection is shown in [Figure 1]. Sensitivity and specificity analysis of diagnostic testing of H. pylori is shown in [Table 2]. Overall, most of the diagnostic tests showed high specificity and moderate-to-low sensitivity when compared to both gold standards tests [Table 2]. AD, SAT, and RUT tests reported significant sensitivities (P 0.040, 0.0023, and <0.0001, respectively). RUT showed the highest sensitivity (87%) compared to AD (62%) and SAT (69%). All diagnostic tests showed significant specificities (P <0.0001). SAT, serum H. pylori, and AD tests reported similar specificities (73%, 78%, and 74%, respectively). RUT showed the lowest specificity (65%) in contrast to BC and histology showed the highest specificity (100%, 89%). The highest specificity among all diagnostic tests was BC (100%). 13C-labeled UBT and real-time polymerase chain reaction assay of H. pylori in stool were not done in this study. Various diagnostic methods are available for investigating H. pylori infection in children. Our study design was targeted toward combining the methodology of our previous study, thus enabling us to explore the accuracy of the invasive and noninvasive tests in diagnosis of H. pylori infection in children. The urease test is a rapid, simple, and cheap method for H. pylori diagnosis, but it is also invasive. It allows the implementation of a treatment when positive., In addition, the accuracy of this method can be affected by biopsy location, bacterial load, and recent antibiotic use. Previous studies have shown sensitivity and specificity of 92.6% and 100%, respectively, for this test. We calculated a sensitivity of 87.2% in our case series. However, RUT had a low specificity of 65%. Indeed, this may be a limitation for use in children <5 years old for which several biopsies are necessary. Serologic H. pylori testing has been widely used for epidemiological studies. Despite its limited recommendations, serology is still often used. In industrialized countries, where the prevalence of H. pylori infection is low, the reported sensitivity of serology is 60%. Our data reported a sensitivity for serology of 51% and demonstrated that it does not reliably diagnose active H. pylori infection in children, supporting the results of other studies. Culturing the organisms remains an exclusive method for antimicrobial susceptibility testing and typing of the organism, but H. pylori is a fastidious bacterium, and the outcome is dependent on the environmental conditions. Culturing of gastric mucosa for H. pylori is an invasive technique. In addition, H. pylori grows very slowly in culture media; culturing is more expensive than other options, is technically difficult, and requires strict conditions. Consequently, this diagnostic method is not widely used in pediatric gastroenterology practice. The reported sensitivities of H. pylori culturing as a diagnostic tool range from 75% to 96.3%. In our study of children with histologically confirmed H. pylori infection, only 39% of the cases showed H. pylori growth in gastric BCs. This very low rate may reflect technical problems during tissue transport and culturing in the laboratory. SAT is widely used to diagnose current H. pylori infection as an alternative to the invasive techniques. The major advantages of SAT are ease of use, rapid result times, and reduced cost compared to the UBT. Gisbert et al. performed a systematic review and a meta-analysis of accuracy of monoclonal SAT for the diagnosis of H. pylori infection. Twenty-two studies, including 2499 patients, evaluated the monoclonal SAT before eradication therapy. Pooled sensitivity and specificity were 94% and 97%, respectively. The validation of monoclonal SAT in children showed a 100% sensitivity and 76.2% specificity to diagnose H. pylori infection, considering the manufacturer's cutoff. In our study, the monoclonal SAT had a sensitivity of 69% and specificity of 73% to diagnose H. pylori infection. The low sensitivity rate may be explained by the different cutoffs and qualitative variation of the SAT. The data of Raguza et al. suggest that the accuracy of SAT in young children from developing countries is not well established. Consequently, SAT should be standardized and validated in all laboratories. Antral mucosa nodularity is an endoscopic finding that includes a nodular or diffuse miliary pattern of small elevations in gastric mucosa, observed predominantly in the antrum. Several studies have reported that the presence of AD is highly predictive of H. pylori infection., In one study, AD was highly specific (98.5%) in the diagnosis of H. pylori infection. Another study showed that the sensitivity of the presence of nodularity as an indication of H. pylori infection in children was 91.6% and specificity was 91%. In our study, we calculated a sensitivity of 62% and specificity of 74% for nodularity. The low specificity and sensitivity for nodularity observed in our study could be due to poor endoscopic classifications and validation. Somily et al. reviewed the Saudi Arabia literature on H. pylori and described the utilization of different diagnostic methods. No recommendations exist from Saudi Arabia and gastroenterologists and other physicians mostly rely on test recommendations from either European or Western countries. One of the strengths of our study is that endoscopy with culture, histology, and rapid urease testing was performed on all patients, which allowed for definitive diagnosis of H. pylori and provided a strong gold standard against which to validate the noninvasive tests in children. This study has several limitations. There is selection bias by including patients who screened positive for H. pylori stool antigen and serology. This might have led to an overestimation of the H. pylori prevalence rate (49.8%) among the study cohort. No biopsy was obtained from gastric body as recommended by NASPGHAN and ESPGHAN. This in turn could have resulted in a lower number of confirmed H. pylori-positive cases and subsequently lower sensitivity of the invasive and noninvasive tests. This study provides important evidence regarding the optimal invasive and noninvasive diagnostic techniques for detecting H. pylori infection in the Saudi pediatric populations. Gastric histology remains the gold standard for diagnosing H. pylori infection, but RUT is a valuable diagnostic method for identifying H. Pylori with the highest sensitivity compared to AD and SAT. All diagnostic tests showed significant specificities but BC and histology showed the highest specificity. We thank Dr Kevan Jacobson (Vancouver, Canada) for editing the manuscript. Malaty HM, El-Kasabany A, Graham DY, Miller CC, Reddy SG, Srinivasan SR, et al. Age at acquisition of Helicobacter pylori infection: A follow-up study from infancy to adulthood. Lancet 2002;359:931-5. Calvet X, Sanchez-Delgado J, Montserrat A, Lario S, Ramirez-Lazaro MJ, Quesada M, et al. Accuracy of diagnostic tests for Helicobacter pylori: A reappraisal. Clin Infect Dis 2009;48:1385-91. Feldman RA, Evans SJW. Accuracy of diagnostic methods used for epidemiological studies of Helicobacter pylori. Aliment Pharmacol Ther 1995;9:21-31. Hunt RH, Xiao SD, Megraud F, Leon-Barua R, Bazzoli F, van der Merwe S, et al. World Gastroenterology Organization. J Gastrointestin Liver Dis 2011;20:299-304. Mégraud F. Advantages and disadvantages of current diagnostic tests for the detection of Helicobacter pylori. Scand J Gastroenterol 1996;31:57-62. Guarner J, Kalach N, Elitsur Y, Koletzko S. Helicobacter pylori diagnostic tests in children: Review of the literature from 1999 to 2009. Eur J Pediatr 2010;169:15-25. Roy AD, Deuri S, Dutta UC. The diagnostic accuracy of rapid urease biopsy test compared to histopathology in implementing “test and treat” policy for Helicobacter pylori. Int J Appl Basic Med Res 2016;6:18-22. Koletzko S, Jones N, Goodman KJ. Evidence-based guidelines from ESPGHAN and NASPGHAN for Helicobacter pylori infection in children. J Pediatr Gastroenterol Nutr 2011;53:230-43. Ni YH, Lin JT, Huang SF, Yang JC, Chang MH. Accurate diagnosis of Helicobacter pylori infection by stool antigen test and 6 other currently available tests in children. J Pediatr 2000;136:823-6. Seo JH, Park JS, Rhee KH, Youn HS. Limitations of urease test in diagnosis of pediatric Helicobacter pylori infection. World J Clin Pediatr 2015;4:143-7. Khanna B, Cutler A, Israel NR, Perry M, Lastovica A, Fields PI, Gold BD. Use caution with serologic testing for Helicobacter pylori infection in children. J Infect Dis 1998;178:460-5. Peretz A, Paritsky M, Pastukh N, Koifman A, Brodsky D, Glyatman T, et al. Improvement and optimization of the classical gastric biopsy culture technique for Helicobacter pylori diagnosis using trypsin. J Med Microbiol 2015;64:642-5. Nguyen TV, Bengtsson C, Nguyen GK, Granstr€om M. Evaluation of a novel monoclonal-based antigen-in-stool enzyme immunoassay (Premier Platinum HpSA PLUS) for diagnosis of Helicobacter pylori infection in Vietnamese children. Helicobacter 2008;13:269-73. Gisbert JP, de la Morena F, Abraira V. Accuracy of monoclonal stool antigen test for the diagnosis of H. pylori infection: A systematic review and meta-analysis. Am J Gastroenterol 2006;101:1921-30. Raguza D, Machado RS, Ogata SK, Granato CF, Patrício FR, Kawakami E. Validation of a monoclonal stool antigen test for diagnosing Helicobacter pylori infection in young children. J Pediatr Gastroenterol Nutr 2010;50:400-3. Miyamoto M, Haruma K, Yoshihara M, Hiyama T, Sumioka M, Nishisaka T, et al. Nodular gastritis in adults is caused by Helicobacter pylori infection. Dig Dis Sci 2003;48:968-75. Bahu MGS, Silveira TR, Maguilnick I, Kulczynski JU. Endoscopic nodular gastritis: An endoscopic indicator of high-grade bacterial colonization and severe gastritis in children with Helicobacter pylori. J Pediatr Gastroenterol Nutr 2003;36:217-22. Łazowska-Przeorek I, Kotowska M, Banasiuk M, Karolewska-Bochenek K, Banaszkiewicz A, Gawrońska A, et al. Value of antral nodularity for the diagnosis of helicobacter pylori infection in children. Med Sci Monit 2015;21:1827-30. Somily AM, Morshed MG. An update of laboratory diagnosis of Helicobacter pylori in the Kingdom of Saudi Arabia. J Infect Dev Ctries 2015;29;9:806-14.